Unless you are living off-the-grid and completely isolated from civilization, the utter necessity of money is a fact of life. Most of our younger days are dedicated to obtaining skills that will help us earn this essential item. While we spend at least five to six days a week working to make a living, there are people who either through lucky circumstances or by taking the risk at the right time hit jackpots. Here are some of those people who became millionaires in unexpected ways. 1. In 2016, to prove to her husband that lottery tickets are a waste of money, a woman named Glenda Blackwell brought a $10 Carolina Millions scratch-off ticket. She ended up winning $1 million. 2. There is a seven-year-old boy who has been reviewing toys on YouTube since he was a toddler. He earns $22 million per year from his videos and his product line at Walmart. He is ranked the highest-paid YouTuber in 2018. After watching toy review channels on YouTube, Ryan asked his mother, “How come I’m not on YouTube when all the other kids are?” He began his vlogging career in March 2015, and his mother quit her job as a high school chemistry teacher to work full-time making review videos. In 2017, his parents signed up with a children’s media startup called Pocket.watch for marketing and merchandise. In 2018, Ryan’s channel also created an app called “Tag with Ryan” for iOS and Android devices. The same year, the channel released a new line of toys called “Ryan’s World” exclusively on Walmart and on Target and later on Amazon.com. 3. In 1992, while searching for a lost hammer with a metal detector, a retiree found a huge cache of Roman treasure containing 15,234 coins. The British government paid him and the landowner £1.75 million for finding it. He also found his hammer later. When farmer Peter Whatling lost his hammer, he enlisted the help of his friend, Eric Lawes, who had received a metal detector as a retirement gift. On November 16, Lawes was searching in Whatling’s farmland in the village of Hoxne, Suffolk, England, when he found the hoard. It contained almost 60 pounds of gold and silver objects, 15,234 Roman coins, several silver spoons, and 200 gold objects. The archaeologists have determined that the objects were from 410 CE, the time when Britain was separating from the Roman Empire. Before Linden Lab’s Second Life, Graef amassed fortunes on other virtual worlds like Asheron’s Call and Shadowbane,though none of that was converted to real-life currency. She began creating and selling custom animations on Second Lifein June 2004. She used the in-game currency (Linden Dollars or L$) she earned to buy and develop virtual land. She reinvested the money to buy more land and currently owns thousands of servers’ worth of virtual land, most of which is rented to users. 5. In 1975, a man named Gary Dahl became a millionaire by selling smooth rocks from Mexico’s Rosarito Beach as live pets to Americans for $4 each. While living in Los Gatos, California, the advertising executive Dahl was sitting with his friends in a Bonny Doon bar listening to them complaining about their pets. He then joked that he had the perfect pet—a rock—which would not require bathing, walking, feeding, and grooming. In addition to that, it would not get sick or old, be disobedient, or die. He then drafted an “instruction manual” full of puns and gags for a pet rock. Dahl bought the rocks for a penny each, and the straw cost next to nothing. His biggest expense was manufacturing the boxes. The “official training manual” was a 32-page booklet called The Care and Training of Your Pet Rock. It contained several commands that can be taught to the Pet Rock such as “sit” and “stay” which can be easily taught. The commands “roll over” and “attack” required a little bit of help from the owner. However, the commands “come,” “stand,” and “shake hands” were impossible to teach. 6. After being rejected by every publisher she went to, a penniless and broke woman named Amanda Hocking decided to publish the novels she had been writing on Kindle. Within six months, she sold 150,000 copies earning $20,000 and 1.5 million copies in 20 months earning $2.5 million. Hocking was a group home worker in Rochester, Minnesota who wrote 17 fantasy young-adult novels during her free time for nine years, all of which were rejected by both book agents and publishers. She is also a huge Muppets fan. In April 2010, she heard of an exhibition about Jim Henson, creator of the Muppets which was going to be held in Chicago in October. She desperately wanted to go. The problem was she couldn’t even afford the $300 needed to get to Chicago, let alone stay at a hotel for the night. 7. During the time of the Great Depression, a banker convinced a small town of struggling families in Florida to buy Coca-Cola shares. The town became the single richest town per capita in the US and now has at least 67 millionaires. In the 20s and 30s, the agriculture-based town of Quincy was struggling to stay afloat. But Pat Munroe noticed that the townspeople were buying bottles of Coca-Cola with what was left of their money. At the time the company’s shares were quite cheap at $19 each. So, he invested in multiple shares, and being a trusted banker, many took his advice and invested too even though the market was down. 8. 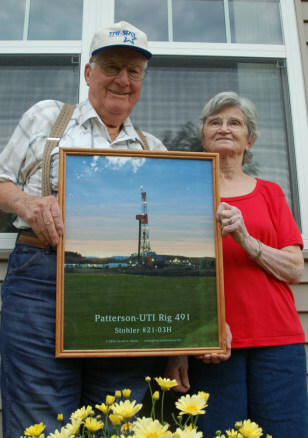 In 2008, a North Dakota couple of modest means lived on their ranch for seven decades before finding crude oil right beneath their land. They were skeptical at first, but the oilmen soon found a large deposit of oil making the couple millionaires within a year. Oscar and Loreen Stohler, 83 and 83 years old respectively at the time, were living in a sod house on their cattle ranch when the oilmen came to them saying they wanted to drill there. Though Oscar doubted there would be any oil, their home is near the Bakken shale formation, a rock unit of about 200,000 square miles (520,000 square kilometers) that formed over 300 million years ago with 3.65 billion barrels of recoverable oil according to the 2008 estimates by US Geological Survey. 9. After finding out how sentimental the Irish-Americans are about the dirt from their country, a businessman named Alan Jenkins began selling bags of imported dirt to them. Now he and his partner own a multi-million dollar company. While at a gathering in Florida of the Sons of Erin, a nonprofit promoting Irish heritage, Jenkins, an Irish immigrant in his 50s, realized that everyone there “would give their right arm for was a drop ‘of the auld sod’ to put on top of their casket.” Five years later in 2006, he met Irish-American agricultural scientist Pat Burke. Together, they managed to get permission from the US Customs Department and Animal and Plant Health Inspection Service after patenting a method to sanitize the dirt to meet standards. Jenkins and Burke founded Auld Sod Export Company and its product Official Irish Dirt. Within a year after their first shipment reached warehouse, their website crashed 15 minutes after launching as they began receiving calls from people interested in starting franchises. They also found out that people weren’t using the dirt just for burials, but that many florists were using it for planting flowers and shamrocks. 10. A man purchased an ugly painting for its gilded frame for $4 at a flea market to find one of the 26 known copies of the United States’ Declaration of Independence made by printer John Dunlap. He later sold it for $2.42 million. The unnamed collector bought the painting in Pennsylvania two summers before 1991. According to David N. Redden, the head of the book and manuscript department at Sotheby’s in Manhattan, upon finding the declaration, the collector decided to keep it as a curiosity as he believed it was probably printed in the early 19th century. A friend of his urged him to show it to an expert and so the collector brought it to Sotheby’s where it was examined.